I am excited to unveil a program of webinars (online workshops) for three months which will then be reviewed whether or not they are successful. If you have any questions or want to find out more then please don't hesitate to email charlotte.smith@westsussex.gov.uk. For further information see a press release here which includes backing from Stephen Hillier, West Sussex County Council's Cabinet Member for Children - Start of Life. What is a webinar? A webinar is an online workshop delivered over the internet. Will my identity be known to others listening? No, you will not be identified by any other participants but will be to the webinar organizer and presenters. Can I ask a questions? Yes, we positively encourage you to participate through webinars by asking questions, answering polls and completing surveys. In our webinars it will just the presenter who is part of the ‘audio’ conversation however you will be able to ‘Text Chat’ / ‘Instant Message’ the presenter. Why webinars? The purpose of the Local Offer webinars is to provide online learning / sharing information. It is aimed primarily for parent carers and professionals working within the field of special educational needs and/or disabilities (SEND). We hope will enable us to build on individual parent and professional knowledge within our community. We live in a large county and know everyone is busy but even more so families with SEND. 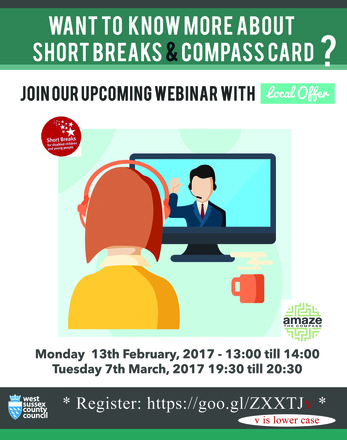 By joining a webinar you can increase your knowledge from the comforts of your home or office (if you can get permission from work). All webinars will be recorded and then posted on the site afterwards. Enabling those who weren't able to join the webinar to still receive the information. 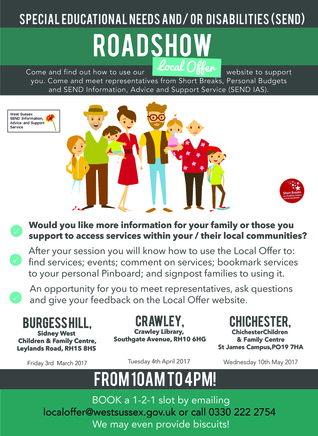 We look forward to involving you in the participation of developing resources on the West Sussex Local Offer. For more information check the Local Offer. I am interested in attending a webinar. What do I need to do next? If you are interested in attending one of the webinars then you will need to register. You need to click on the below links. You will then be able to enter in your name and email. I have registered... now what? Add the date to your diary. You will also receive an email reminder of the session. You will simply need to join the session on the day through the link in the email. This is something new and we are all learning. If you would like any help with regards to any of these webinars then please feel free to contact Charlotte who will answer your questions. Contact a Family have been using webinars to share information. On their 'Resource' page they have a series of webinars for you to see. If you would prefer to talk to someone face-to-face and find out more about local support in our community new Roadshow dates have been added. Find out more here: here. Interested in delivering a webinar or could suggest a topic? Get in-touch.